Are batteries included in Ultraloq smart locks? Batteries are included for all US orders. Unfortunately, we cannot include batteries for customers outside of the US because of limitations on battery transportation and shipping by express courier. Does Ultraloq UL1 / Combo / UL3 BT smart lock work with Android and iOS? Is Ultraloq UL1 / UL3 easy to install? Yes, you can install it in minutes with just a screwdriver! UL1 / UL3 fits all standard doors with bore hole of 2 1/8" (53 mm) diameter. If your door is not prepped with bore hole, you can use the template included in the box as a guide to drill the hole as well. How can I add a new User in new Ultraloq UL3 smart lever lock? press "↵" → "Finger or Code", enroll fingerprint or code twice. "Sucess" will pop up if success. How does Ultraloq Bridge work? Simply plug your Ultraloq Bridge into any power outlet near your Ultraloq UL1 / Combo / UL3 BT smart lock and connect your home Wi-Fi for Internet access. Now you can control your Ultraloq smart lock remotely. Ultraloq Bridge allows you to unlock, share eKeys to your guests for scheduled access, and view access logs from anywhere. What is the warranty for Ultraloq UL1 / Combo smart lock? 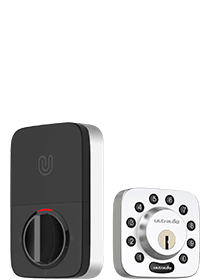 Ultraloq UL1 / Combo smart lock has a 1 year electronic warranty and lifetime mechanical warranty. Which Ultraloq smart lock does Ultraloq Bridge work with? Ultraloq Bridge works with all Ultraloq models with Bluetooth connectivity including Ultraloq UL1 smart lock, Combo and UL3 BT smart lock. What are the thickness ranges that Ultraloq UL1 / UL3 smart lock can support? Ultraloq UL1 / UL3 smart lock can be installed on any door with a thickness between 1.3 ~ 1.96 inch (33 ~ 50 mm). If you have a thicker door up to 2-3/4 inch (70 mm), optional thick door kit is required. Can Ultraloq UL1 / Combo / UL3 smart lock be installed on a right handed or a left handed door? Yes, the handle of Ultraloq is designed to be reversible so you can install on either one. Can standard door knobs or levers be replaced with Ultraloq UL1 / UL3 smart lock? How long is Bluetooth range of Ultraloq UL3 BT smart lock? Around 10 feet / 3 meters. 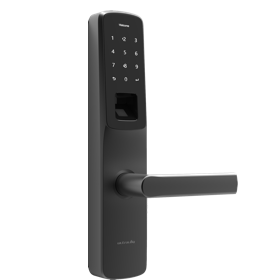 Can I enroll multiple fingerprints or codes in Ultraloq UL3 smart lever lock? Yes, each User can enroll up to 95 fingerprints or codes. How do I reset my Ultraloq UL3 smart lever lock? Open the battery compartment, press the Reset button until you hear a “beep”. The device will start resetting then. My fingerprint or code cannot unlock Ultraloq UL3 smart lever lock. Fingerprint or code hasn't been enrolled. How long should my codes be in Ultraloq UL3 smart lever lock? From 4 to 8 digits. How can I delete Administrator in Ultraloq UL3 smart lever lock? After activating the lock, press "↵" on touch keypad for 3 seconds. After you see "Menu" on LCD, press "8", press "↵", and press Administrator fingerprint or enter Administrator code. "Complete" will pop up if success. What can I do if I forget the Administrator code in Ultraloq UL3 smart lever lock? 1. We strongly recommend you to keep a record of the Administrative code. 2. You can reset the lock to factory default and Administrator code will be deleted. How can I add an Administrator fingerprint or code in Ultraloq UL3 smart lever lock? Hold "↵" on touch keypad for 3 seconds. After you see "Menu" on the display, press "7" and press"↵". Enroll your fingerprint or password twice. "Complete" will pop up on the display if success. How can I keep all Ultraloq UL3 User ID for record? We provide you with a form in Ultraloq UL3 package. How many Administrator does Ultraloq UL3 smart lever lock support? 1 Administrator. Multiple Administrator fingerprints and codes can be added. How can I delete a User in Ultraloq UL3 smart lever lock if I forget the ID? 1. We strongly recommend you to use the Form in the box to keep a record of all User Names and ID. 2. If you forget the ID, you can reset the lock to factory default and all Users will be deleted. How can I delete a User in Ultraloq UL3 smart lever lock? After activating the lock, press "↵" on touch keypad for 3 seconds. After you see "Menu" on LCD, press "2", press "↵", enter User ID and press "↵". Enter the User ID again. "Complete" will pop up if success. I cannot enroll my fingerprint or code in Ultraloq UL3 smart lever lock. The fingerprint or code exists already. How to enter Setup Mode in Ultraloq UL3 smart lever lock? Hold "↵" on touch keypad for 3 seconds and press Administrator fingerprint or enter Administrator code. What can I do if my finger gets wet and Ultraloq UL3 smart lever lock doesn’t scan my fingerprint? Dry your finger and fingerprint sensor then try again. How can I change the Ultraloq UL3 handle direction? Is Ultraloq UL3 smart lever lock suitable for left-hand and right-hand doors? Yes, Ultraloq UL3 can be installed on both left-hand and right-hand doors. Can I replace my existing door lock for an Ultraloq UL3 smart lever lock? Ultraloq can relplace your existing lever door locks but not deadbolts. 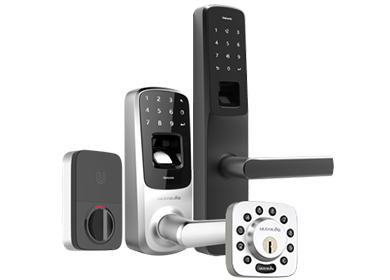 Does Ultraloq UL3 smart lever lock provide warranty? Ultraloq UL3 includes one-year warranty for factory defects.